Terraced hill landscapes provide flat surfaces for plants to grow on in hilly areas. They help the gardener maximize usable space and prevent excessive runoff. 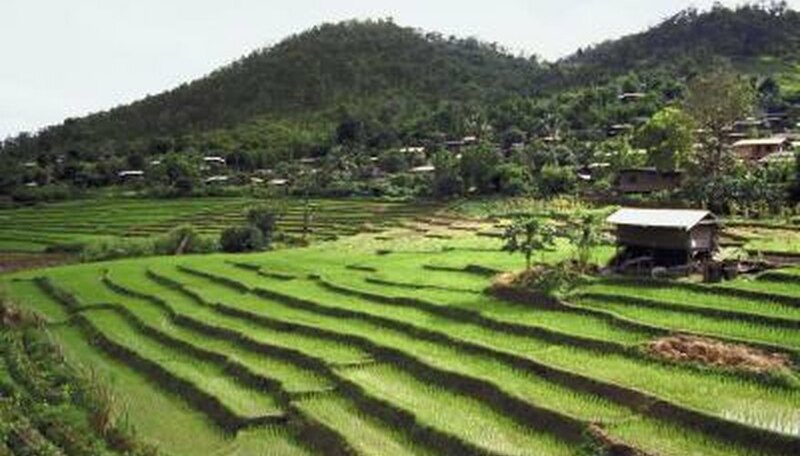 Less runoff also prevents erosion and helps with water infiltration, which means terraced land needs less irrigation and loses less soil. Most gardeners use wood to create terrace edges, although some use bricks, rocks or concrete. Measure the rise of the hill to determine how many terraces you will build. On moderately sloped hills, each terrace should be about 2 feet tall. A 10-foot-tall slope will need five terraces. If the hill is incredibly steep, the terraces can be taller than 2 feet to eliminate the need for as many levels. Very gradual slopes can have shorter terraces. Measure the run of the hill to determine the length of the terraces. The horizontal distance from the base of the hill to the point beneath the center of the hill, also called "the run," will determine the length of the sides of each terrace. For example, consider a hill with a 10-foot rise and 20-foot run. If the hill is going to have five 2-foot tall terraces, each of the five terraces will have to have 4-foot-long sides to span the 20-foot run of the hill. Measure the width of the hill to decide how wide to make each terrace. Many terraced gardens have terraces that are all the same width. However, some have terraces that get smaller toward the top of a hill if the garden is on a hill that gets smaller toward the top. Some terraces might also be less wide to avoid a tree or another structure in the yard. Buy or cut timber to use for the walls of the terraces. Each terrace needs one piece of timber across its front and two side pieces. The pieces need to be about 1 1/2 to 2 times as wide as the height of the terraces, so that one edge of the timber can rest underground for stability. Dig a trench along the bottom of the hill to place the first terrace support wall inside of. Make sure the trench is wide enough so that the timber fits inside it. The trench should be about one-half to one times as deep as the height of the terrace. Dig the trench so that the timber sticks up to the correct terrace height when placed in the trench. Place one of the pieces of timber in the trench and pack soil around it. Dig a trench along each side of the terrace by digging into the slope. Make sure the bottom of the side trenches are level with the bottom of the first trench, so that the timber will rest at an even height along the sides of the terrace. Place timber in each side trench, and pack soil around it. Drill holes downward through the pieces of timber near the ends of each piece. Pound metal spikes or pipes through the holes and into the ground to secure the timber in place. Shovel soil from the back of the terrace to the front of the terrace to level it. Repeat Steps 5 through 11, digging the trench for the next terrace's support wall along the back of the previous terrace. Keep building terraces until you reach the desired height or top of the hill.